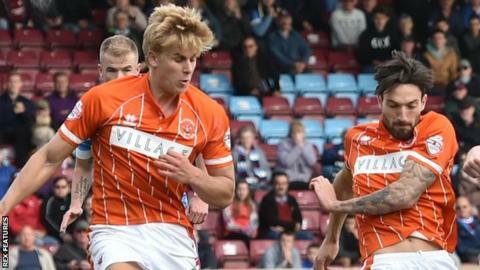 Blackpool moved out of the League One relegation zone with an emphatic win over Scunthorpe United. The Seasiders went into the game as the division's lowest scorers, but Tom Aldred's header and Brad Potts' finish put them 2-0 up within 12 minutes. Potts added his second when played through by David Norris who then pounced after a goalmouth scramble. Danny Philliskirk's first goal for Blackpool capped the rout as the hosts climbed to 19th. "That can never happen again, that was really poor today....it's left me feeling angry and that some players just can't handle the situation. "You can look at some of the stats and try to get some comfort out of it, doesn't make any difference really, you come back to the scoreline. The five goals in reverse has been massively, massively disappointing. "I take 100% responsibility for all results, that's the nature of the business, I'm not shirking away from anything." Match ends, Blackpool 5, Scunthorpe United 0. Second Half ends, Blackpool 5, Scunthorpe United 0. Attempt missed. Paddy Madden (Scunthorpe United) right footed shot from the right side of the box is too high. Goal! Blackpool 5, Scunthorpe United 0. Danny Philliskirk (Blackpool) left footed shot from the centre of the box to the bottom right corner. Assisted by Brad Potts. Corner, Scunthorpe United. Conceded by Colin Doyle. Attempt saved. Paddy Madden (Scunthorpe United) right footed shot from outside the box is saved in the top right corner. Luke Williams (Scunthorpe United) wins a free kick on the right wing. Attempt missed. Murray Wallace (Scunthorpe United) header from the right side of the six yard box is close, but misses to the right following a corner. Corner, Scunthorpe United. Conceded by Will Aimson. Corner, Scunthorpe United. Conceded by Bright Samuel. Substitution, Blackpool. Jarrett Rivers replaces David Norris. Attempt saved. Jamie Ness (Scunthorpe United) right footed shot from outside the box is saved in the centre of the goal. Attempt saved. Jamie Ness (Scunthorpe United) left footed shot from outside the box is saved in the bottom left corner. Substitution, Blackpool. Bright Samuel replaces Mark Yeates. Attempt saved. Neal Bishop (Scunthorpe United) left footed shot from outside the box is saved in the centre of the goal. Substitution, Scunthorpe United. Scott Wiseman replaces Jordan Clarke. Corner, Blackpool. Conceded by Luke Williams. Corner, Blackpool. Conceded by Luke Daniels. Attempt saved. Mark Yeates (Blackpool) left footed shot from outside the box is saved in the top centre of the goal. Corner, Blackpool. Conceded by Scott Laird. Attempt missed. Stephen Dawson (Scunthorpe United) right footed shot from outside the box is high and wide to the right. Goal! Blackpool 4, Scunthorpe United 0. David Norris (Blackpool) left footed shot from the centre of the box to the top left corner. Attempt saved. Jim McAlister (Blackpool) right footed shot from the left side of the six yard box is saved in the centre of the goal. Attempt missed. Neal Bishop (Scunthorpe United) header from the left side of the six yard box is close, but misses to the left following a corner. Attempt saved. Jordan Clarke (Scunthorpe United) left footed shot from outside the box is saved in the bottom left corner. Attempt saved. Neal Bishop (Scunthorpe United) right footed shot from outside the box is saved in the bottom left corner. Jim McAlister (Blackpool) wins a free kick on the left wing. Second Half begins Blackpool 3, Scunthorpe United 0. First Half ends, Blackpool 3, Scunthorpe United 0.